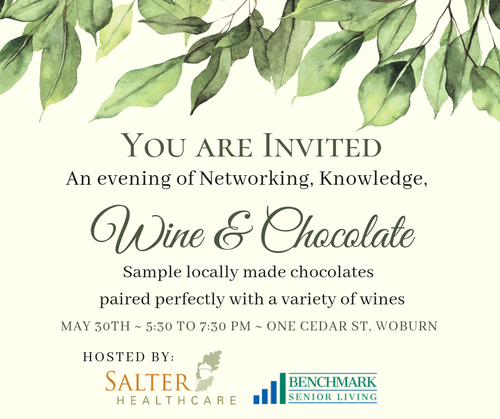 We are joining with the Woburn Business Association and the North Suburban Chamber of Commerce to support this fun event sponsored by Salter HealthCare and Chocolate Therapy at Benchmark Senior Living at Woburn for an evening of networking, knowledge, wine and chocolate! Learn how recent healthcare changes may affect you as a consumer and what factors impact your options so that you can be armed with the information needed to make informed healthcare decisions for yourself and your loved ones. We?ll wrap up the evening with locally made chocolates featuring antioxidant-rich ingredients paired perfectly with a variety of wine coupled with a little knowledge from the experts on how to create your own pairings at home.